Here’s a little jazz by the sea, to entertain this tourist. Paradise Cove doesn’t get too many of these visitors on shore; occasionally I spot a lone sea lion’s head bobbing through the nearby surf, but this is the first time that I’ve seen one hauled out on this beach to catch some rays on a rock. This cutie is about six feet long, and weighs hundreds of pounds. Hey, watch out for that that wave! Took this photo on Monday, late afternoon. Just the day before, we were leisurely kayaking around the Santa Barbara harbor for kicks, saying hi to neighbors and keeping up a running commentary on every vessel of interest we paddled by. A sudden whoosh in the water at the bow was immediately followed by the large, whiskered head of a harbor seal who came up for air inches from my toes. We said hello to each other and off he went to explore some of the same sailboats I had been checking out. But he had a more interesting view, diving under the hulls and amusing himself with the variations of life that insistently cling to rudders and keels despite the wishes of their owners. Left uncleaned, every idle boat’s underside quickly becomes a makeshift reef for barnacles, limpets, sea stars and forests of algae. The harbor seals seem to enjoy this peculiar aquarium as much as I do. A little bit of “Water Crossing” accompanies this photo of some that’s very ready to be traversed. This is the lovely scene that greets us each time we leave the coziness of our sailboat and walk back up the dock. 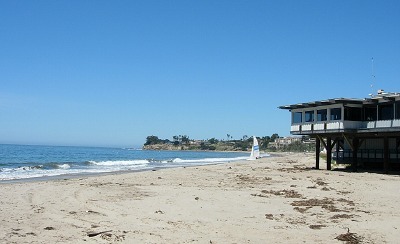 The Santa Barbara Yacht Club building stands guard over the incoming tides and outgoing day racers; in winter the sand is plowed 20 feet high, creating a berm to protect those spindly legs from the power of the sea. But it is no longer winter, the berm has disappeared, and in its place is flat kelp-strewn shoreline that is about to welcome a lineup of Hobie cats ready to take up informal residence for the summer. The first of many is in the distance. 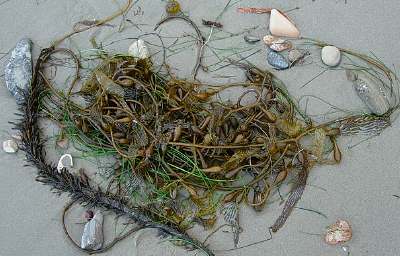 My own internal shoreline is seeing a similar shift. I’ve come to a welcome cadence in the back-to-back deadlines I’ve faced over the past eight months, delivering a number of pieces with tight performance dates attached to them. And now I have the luxury of using my time toward completing some music projects for myself this summer, until the next round of deadlines comes in like a fresh tide. I’m exhaling as I type this. Click on the blue music icon above to hear some of “Unabashedly,” my newest quartet. 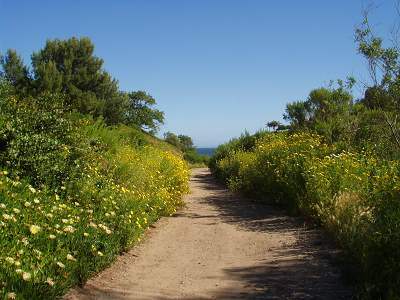 The path I walk to the sand from the front door has spent all of May lined with thrilling outbursts of yellow blooms: canyon daisies and ice plant here; a few yards forward, mustard and dandelions. As dizzying as the sight is, the smell is twice so. Pungent sages are everywhere in between, and I cannot pass by without wrapping my palm around a stem and gliding my hand upward to attach the scent. Like the euphoria of the stroll, it stays with me long after I return to the studio. Smudge, coming and going. At least, in his mind. I finished my work/procrastination/work/puttering for the night and walked into the living room to place a few packages of orders by the front door for the next day’s mail pickup. A bright light caught my eye. 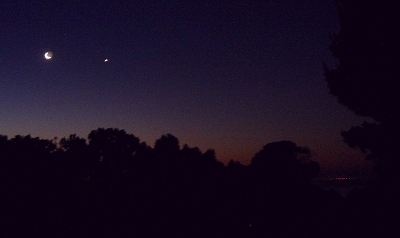 Turning toward the east-facing windows, this is what I saw: our moon and Venus, in a lovely pas de deux above the Santa Monica bay. The thin crescent of what’s left of that green cheese couldn’t hide the rest of its orb: this wonderful sight is called earthshine. Sunlight bounces off our planet and reflects against the face of the moon. And then back again, to my face. Beaming. I padded out to the deck and, lacking a tripod, placed my little camera on the top of the hot tub cover for steadiness. Maybe only a woman would make a comparison between composing and childbirth. Immediate disclaimer: I’ve done lots of the former and absolutely none of the latter, so hey, what do I know, anyway? But somehow, each new piece feels like a birthing process: something I’m emotionally attached to, that’s fraught with potential problems along the way, and whose eventual reality is a joyous gift in my life (would that the last statement be the case for all mothers; sadly, it’s not). As the spring flowers bloom passionately on this Cove bluff path in the wake of last night’s downpour, so do these new notes of mine that finally reached the air for a deep breath a couple of weeks ago here in L.A., in the very capable hands of the musicians of the long-standing Chamber Music Palisades concert series. The green button will lead you to credits and info; the blue to a snippet of my… uh, delivery. All went smoothly; no painkillers were needed. I’ve always felt that it’s important for a composer to have a life outside of music. And that it’s also important, no matter how hard you work, to create some down time on occasion to recharge all that creative energy. I work ridiculously hard, because I’m compelled and manic, in a happy sort of way. I get to sleep anywhere between 5am and 7am, and am up again no later than noon most weekdays; composing and administering said compositions for all the hours in between, when I’m not in town moderating a panel, or speaking on one, or rehearsing a piece, or grocery shopping (see below; one does eventually run out of peanut butter) or chairing a board meeting, or cleaning up kitty erp (see below). It’s a wonderful life. And this snapshot, taken about an hour ago, and posted just as a late-season storm rolls in off the Pacific as our hot tub warms up (are you tempted to visit yet? ), shamelessly represents the Sybaritic, hedonistic, non-Puritanical approach Charles and I share in life that rivals only those sultry Corona beer ads on TV (some of you may be familiar with them). Sundays are traditionally our day to be together and unwind, and either we’re on our sailboat in Santa Barbara (no, not this one in the photo), or we’re home at Paradise Cove. This winter’s weather– as you can see from many of my photos on this blog– has been cool and overcast, with a fair amount of rain. 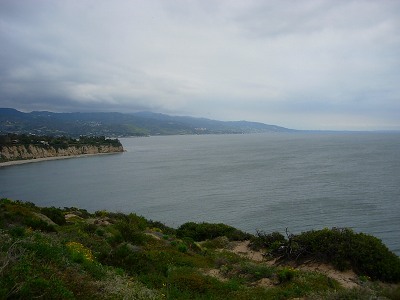 So more weekends have been spent in Malibu, and our Sunday hallmark is always a walk up the coast (the lower the tide, the longer the stroll), followed by emergency consumption of wine and other less vital yet still important nutrients often found in solid food. 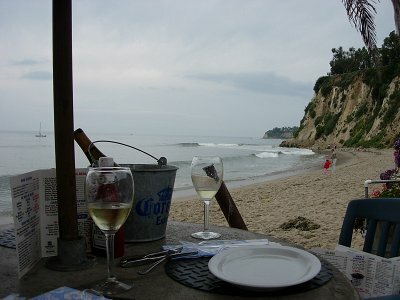 Table on the sand: check. Sailboat floating near the horizon: check. There is not a moment in my life when I do not celebrate such good fortune, and wish to share it with everyone. Ah, if cats could talk. (good thing they can’t or my reputation would be in serious peril). 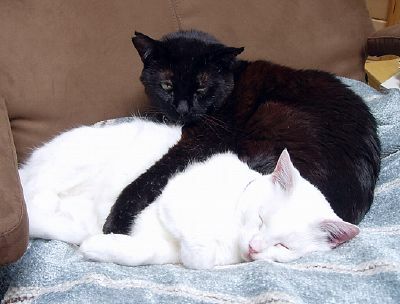 Well, maybe they can’t talk, but this pair sure knows how to sleep. In fact, they’ve perfected the many subtle variations on the same sleep theme, never seeming to tire of any. 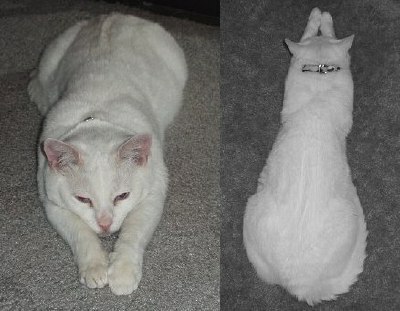 I could make a non-sexual Kama Sutra of kitty sleeping positions from all the photos I’ve got. I am about to learn from these household masters, Smudge and Moses, and hit the sack after a long night in the studio. Click on the blue music icon above to hear some of the Adagio movement from my “Trio for Clarinet, Violin and Piano”. 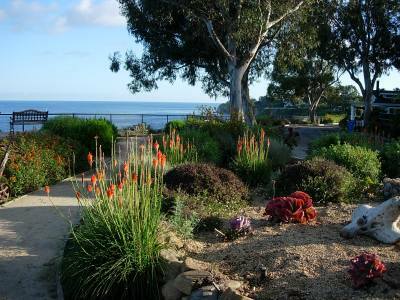 On the phone with a dear friend today, we chatted about our various travels and she asked, “if you weren’t in Paradise Cove, where would you choose to live?”. Latitudes to the north and to the south sprang to my lips, some within the U.S. and just as many outside these borders. I mentioned something about preferring to be warm. “Florida!” she proclaimed. I shot the idea down without a moment of hesitation, out of hand. Nothing in particular against Floridians, although I sure would keep a careful eye on the current high level employees in the State government. No, my prejudice against Florida has solely to do with its… geology. Did I mention how flat it is? 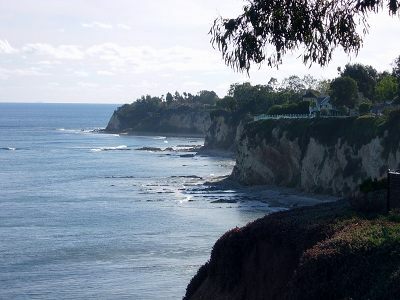 The thing I love the most about the craggy beaches of Malibu are these rocky, crumbling bluffs. One moment you’re on the sand, and the next you’ve got a sweeping vista across the waves to the Channel Islands. Of course, this works in reverse, too: more than a few folks with those nice views have unceremoniously ended up with sand and salt water in some unexpected places. That large house you see (which happens to belong to a Really Famous Couple) may not have quite as much yard for cocktail parties a few years from now. Click on the blue music icon above to hear the main title from The Last Job, a film I scored many years ago. I just KNOW there are some good notes in here…. somewhere…..
Click on the blue music icon above to hear a clip from the Scherzo movement of my “Sonata for Piano”. 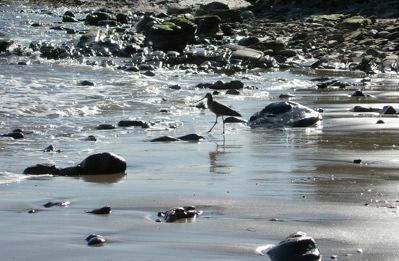 Like this godwit I stalked the other day, I am currently looking for a meal, but with less luck. I have a bad habit of going to the supermarket and stocking up on lots and lots of good things, and then not going again until all those good things are gone. Feast to famine; the direct result of my laziness/utter absorption in my work and life/inattention to basic needs. So here I am, foraging for a late dinner and sufficing with… several spoonfuls of peanut butter. Healthy and tasty! But not quite a well balanced repast. Oh wait…. I still have some ice cream…. ahhhh, now my meal is complete. Click on the blue music icon above to hear a movement from my “Evensong Suite” titled “Ascendit Deus,” to accompany this personal ascension. Per the item below, here’s another example of why going to the post office can be so much fun.